You’ve been talking, and we’ve been listening! 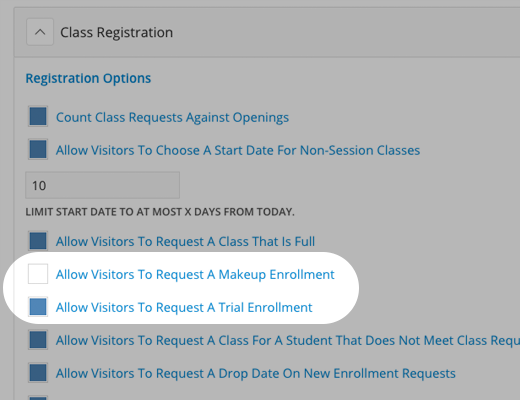 We have officially separated the settings in the parent portal to allow customers to request trials and make up lessons. This enables businesses to have more control over what type of requests are coming in through Online Activity! These settings will default to enabled or disabled based on your previous choice for the combined setting “Allow Visitors to Request A Specific Enrollment Type Such As Active, Trial or Makeup”. This enables customers to choose the enrollment type of "Makeup" online. All Makeup enrollments will come through Online Activity as a request for staff member approval. No charges will accompany makeup enrollments. This enables customers to choose the enrollment type of "Trial" online. All Trial enrollments will come through Online Activity as a request for staff member approval. No charges will accompany trial enrollments.